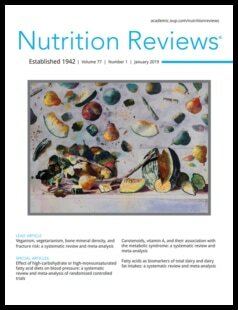 Nutrition Reviews is a leading peer-reviewed journal dedicated to the publication of authoritative literature reviews that analyze and synthesize existing and emerging knowledge in the field of nutrition science. It is published by the International Life Sciences Institute in partnership with Oxford University Press. Read a selection of the journal’s most highly cited content for free. Nutrition Reviews was founded in 1942 in response to a recognized need for expert analysis and synthesis of the vast amounts of nutrition science research being generated worldwide. Today, that need is greater still and Nutrition Reviews continues to serve it with the same goal in mind: To help nutrition scientists, scholars, practitioners, and policy makers stay abreast of significant developments in the field through concise reports prepared with objectivity and a critical focus.